The Better Design proposes that cut and cover tunnels be constructed to create a connection between the Arden Macaulay precinct and the Tullamarine Freeway. The design allows for the tunnel to travel beneath CityLink and the Upfield rail line (which is proposed to be lowered) and then under Racecourse Rd to emerge on the fringe of Debney Park. The 2 lane road would then travel over Mount Alexander and above the Tullamarine Freeway on-ramp to access the freeway to the north. For cars travelling south on the Tullamarine Freeway that wish to enter the tunnel, they would firstly take the Flemington Rd off-ramp and then enter tunnel. The tunnel would travel under the red match sticks, under Racecourse Rd and then continue through the Arden Macaulay junction to the east. At Mount Alexander Rd, an exit and entrance could be included for the local streets if this was deemed necessary. There would be one entrance lane and the exit would expand into three lanes, two right turning lanes towards the City and one left turning lane to Mount Alexander Rd. An earlier iteration of the design had the road rising up out of the ground, extending through the playground and then rising up over Mount Alexander Rd. However after further consultation and consideration the design was modified so that the road travels around the playground, under the edge of the CityLink sound tube. Additionally, the exit ramps were modified so that they are located directly under CityLink rather than impacting the community centre. A noise wall has been proposed to run alongside the rising viaduct from Racecourse Rd to near Mount Alexander Rd. The noise wall would be above ground at the northern end of this section so that pedestrian and bike access can be made available to the Moonee Ponds Creek bike track, after it has been reinstated. 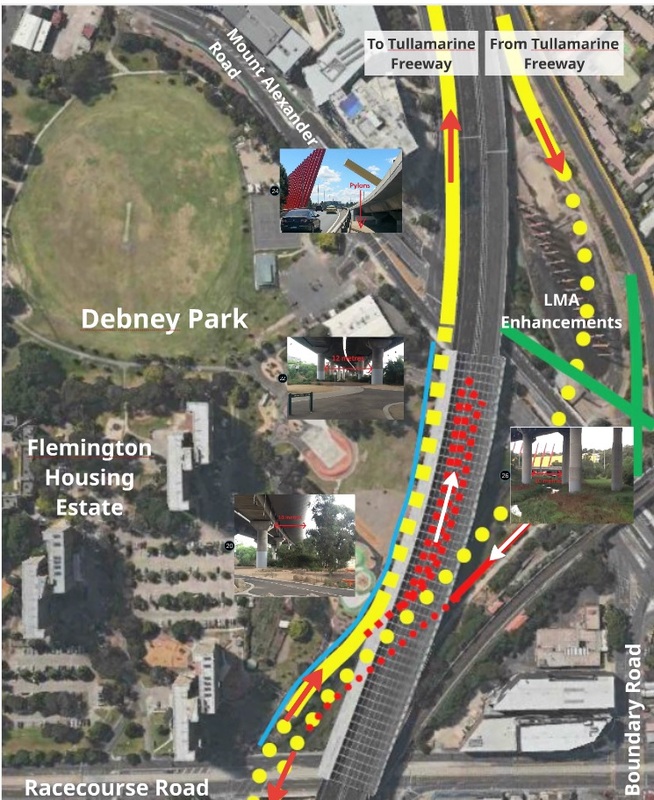 To compensate for impeding on the amenity of Debney Park during construction and to replace the small amount of the park that would need to excised near Racecourse Rd, one suggestion is for the project to pay for the carpark in the Flemington Housing Estate, adjacent to Racecourse Rd, to be doubled in capacity by building either under or over the carpark, which would provide the opportunity for the other carpark area to be returned to open space. The aerial photograph has been annotated to help explain the various elements. Smaller photos taken at ground level have also been included to show that the dimensions of CityLink would allow the integration of the tunnel interchange with the Tullamarine Freeway (CityLink north of Flemington).